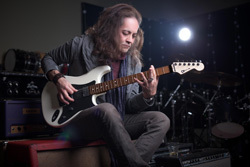 Red Dragon Cartel marks the return of accomplished guitarist Jake E. Lee (Ozzy, et al), who has basically been living in Las Vegas and flying under the radar for the last several years, to the hard and heavy music scene. He worked with good friend Ronnie Mancuso, noted bassist, composer and producer for Beggars & Thieves, and others to write some new songs. A shout was put out on Facebook for a lead singer and a drummer. Vocalist Darren James Smith and drummer Jonas Fairley got the slots. The quartet then recorded most of the material. However, the recording session was also gifted with some guest talent including Paul Di�Anno (ex-Iron Maiden), Robin Zander of Cheap Trick, as well as Maria Brink from�In This Moment�and�Five Finger Death Punch�s Jeremy Spencer, adding vocals. However, it's not clear from press material who sung on what song. So there you have the skinny on the who, wha,t and why. So how does the album sound? In a few words: pretty darn terrific. Throw out any conceptions of his Ozzy tenure or later skirmishes with blues guitar rock. It's generally straight up melodic heavy rock and metal with a modern tone, driven by Lee's wall of riffage and wicked good guitar solos. Additionally, underneath all this is some serious groove getting your toe tapping, while you're banging your head. Shout It Out, Slave, and the terrific Wasted are good examples. Alternatively, RDC can be thumping heavy metal, blistering in the shear heaviness as with War Machine or Big Mouth. Also, if you listen carefully, Lee's blues licks can be found, a touch in the latter half of Wasted and more than a little flavor in Redeem Me. The latter features Maria Brink (I think), alternating between raging rock and sultry torch singer. The album rounds out with something completely different number, a soft piano instrumental, Exquisite Tenderness, which lives up to it's name and, I'm guessing again, that's Lee on the piano. Red Dragon Cartel's debut finds guitarist Jake E. Lee in fine form with more than a few guitar licks and tricks up his sleeve. Recommended. Red Dragon Cartel's debut finds guitarist Jake E. Lee in fine form with more than a few guitar licks and tricks up his sleeve. Recommended.